You can also display the RGB values and names of your solid colour swatches instead of only the name. This option is not available when displaying the colours in Swatch mode. 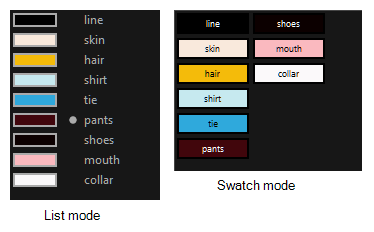 Select Colours > Swatch Mode to display the swatches. Deselect Colours > Swatch Mode to display the colour list. From the Colour View menu, select Palettes > Display Colour Values. 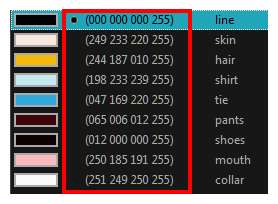 The solid colour swatches’ RGB values are displayed between the colour swatch and its name. The gradient colour swatches will be identified as (gradient).